These days, almost all of the big "A Circuit" horse shows are livestreamed. The value of these livestreams is immense. We have all heard that watching others ride can improve our riding. But when we actually go to horse shows, we spend more time talking to our friends or with our face in our phones. What if we were able to watch horse shows on our phone, without these distractions? We absolutely can, thanks to websites like USEFNetwork.com and eqsports.net. The Devon Horse Show and Country Fair is running through this weekend, and the Upperville Colt and Horse Show starts June 4th, both livestreamed on the USEF Network. These are two of the oldest and most iconic horse shows in the country. Do your homework and tune in! What is a... Hunter Derby? This past Friday night, several of my students joined me at the 2017 Jump for the Children Horse Show in Raleigh, to watch their International Hunter Derby. Leading up to the event, I heard the same question a number of times: What is a hunter derby? The hunter derby began as an idea in 2006 between George Morris and other top professionals as they were discussing how predictable and simple the hunter ring had become. If you're not even sure what the hunter ring is, it's the subjective ring at a hunter/jumper horse show. This is where the horse goes over a simple course of natural obstacles and are judged on their way of going, their manners, consistency, and style. Basically how pleasant they look to ride. Conversely, the jumper ring is completely objective. Their goal is to jump a more challenging course of jumps without knocking them down within a set time or as fast as they can. You can see how one of these sounds much more exciting to the average spectator, which brings us to the other issue hunter derbies have been trying to solve. Most people see the hunters as boring to watch. The hunter derby breathes a little life and excitement into the hunter ring. Once the course is set, handlers handwalk horses around the arena. This handler is showing his horse the jump. So what makes a hunter derby different from a typical hunter class? First off, the horses cannot practice over the course. In typical hunter shows, you are allowed to do a warm-up class or at least flat in the ring to see the placement of the jumps and the striding. In the hunter derby, the horses are only allowed to be handwalked in the ring once the course is set. There are two rounds in a hunter derby. The first round is similar to a regular hunter round, but instead of your usual "single - diagonal line - outside line - diagonal line" course, the derby course is a little less predictable. There might be bending lines, long gallops to jumps, unrelated distances, etc. Additionally, there are four option jumps. The option jumps offer a low and a high jump, where you get an extra point for every high option jump you take. This rider is jumping the high option. The low option is to her right. The top twelve riders from round one come back for the second round, the handy round. The course will likely change a bit. It still includes the high options for bonus points, but the horse and rider can also earn up to 10 handy bonus points from each of the judges. Handy points are awarded for successfully navigating a more difficult route, whether that means tighter turns, jumping on an angle, etc. There could also be a trot jump on the handy round, to show that your horse is still listening to you halfway through the course and is willing to come back to the trot. Some shows have the ability to include a bank in the handy round or even ask the horses to jump out of the ring. This rider is approaching the trot jump in the handy round. There are many different levels of hunter derby. The highest level (and the one we watched on Friday) is the International Hunter Derby. Fence heights are 3'6" to 4', with the high options set at 4'3" or higher. The National Hunter Derby fence height is 3', with high options at 3'5". This allows young riders and green horses to participate. There is also a Pony Derby, and many smaller derbies at the various levels of horse shows. 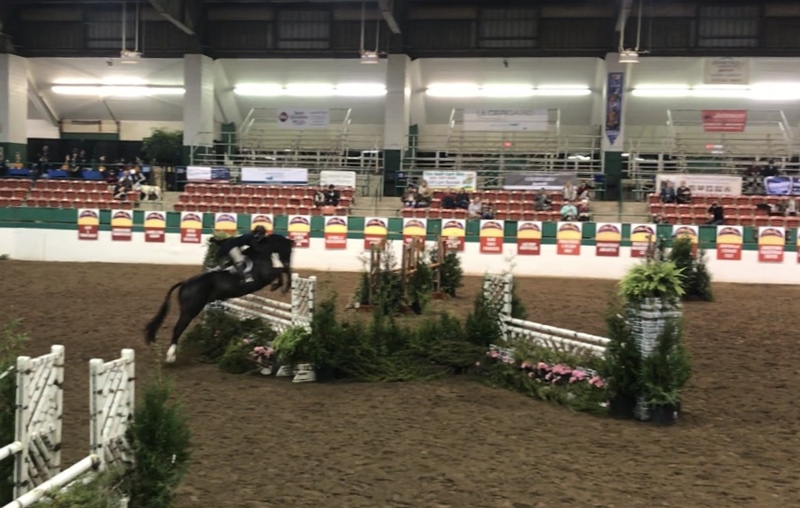 If you didn't get a chance to come out to watch the International Hunter Derby last week, the second week of the Jump for the Children Horse Show starts tomorrow and they will have a National Hunter Derby on Friday, November 17th at 6:30PM. Local Finally Farm in Raleigh is also having their Hunter Derby Finals this Saturday, November 18th at 8AM.